Is anyone actually using this component with v1.3 on windows? If it doesn't work anymore, I want to update the component registry to make that clear. Just uploaded version 2.1.0 to the component registry. All return a date/time string like "2018-03-04 12:34:56" exactly the same as their counterparts from foo_playcount. If the time doesn't exist, "N/A" is returned, but $if2, or the bracket format ([%lastfm_added%]) will not display the N/A. Thank you!!! The time I first listened to the songs is the most important information for me. or is the component requesting this information from Last.fm every time it is asked by foobar2000? In other words, can I retrieve this information (gradually - I got that it can't be done at one go) for all my files permanently? Yes. The information is stored in a database inside the index-data folder. It will persist even if you delete your last.fm account (so long as you don't delete the database or clear the records for those files). So first of all, thanks for the awesome plugin! I've been using it only for a little while but it works great! I was wondering if it would be possible to add another field to display the total number of plays an album has according to LastFM (the number of scrobbles on the album page), or if that would be too complicated. I've been trying to display the total number of plays every album has under each album using Facets and your plugin but the way Facets works it creates separate entries of the same album for every track with a different number of plays. If this is already doable somehow please feel free to enlighten me. I have a little problem with my username in last.fm and your plugin. As you can see the component change the "_" of my username for "%255f". #text	"Eat 'em and Smile"
#text	"07 Apr 2018, 04:05"
If that resolves your problem (and nobody else reports an issue) I'll put it up in the official component registry. BTW: Big changes are coming soon. Almost finished multi-threading and removing all restrictions on amount of scrobbles to retrieve and the max 50 tracks to retrieve from. I haven't seen any issues in 24 hours, but I need to refine a few things still. With any luck I'll have it out for beta by the end of this week. If I don't see any issues or complaints, I'll probably make this official at the end of the weekend. I just came by to say thank you for the latest version. It runs very reliably, even with the large number of scrobbles I've collected over the years. To the point where the max. retrieved scrobble per artists will be reached (currently 9,999? ), I'm going to use it with great pleasure. My top artist leads the way with currently 9,485 scrobbles, so this will not be the case in the next weeks. Officially released v2.5.1 in the official registry. Just a version bump from the beta for auto-update purposes; no other changes. You shouldn't run into any issues. After we have scrobbles for an artist, the next plays only checks scrobbles up to the last recorded scrobble of that song. So if you last scrobbled the song 250 scrobbles ago, it would pull the last 400 scrobbles (we pull 200 at a time) and stop checking for new scrobbles once the timestamp is older than the last scrobble. If you want to make extra sure you don't miss anything, just select all songs by your artist with the most scrobbles, and then right-click and retrieve scrobbles. I still see and get version 2.1.1. Adding %first_played_enhanced%, %last_played_enhanced% and %added_enhanced% methods. These would compare (for example) the %first_played% and %lastfm_first_played% fields and return the oldest, etc. Are you guys okay with those field names? I couldn't think of anything better. I also think I'm going to move the last.fm retrieval to when a song initially starts playing, and not just at the time %play_count% gets increased. I think that will provide a better user experience. 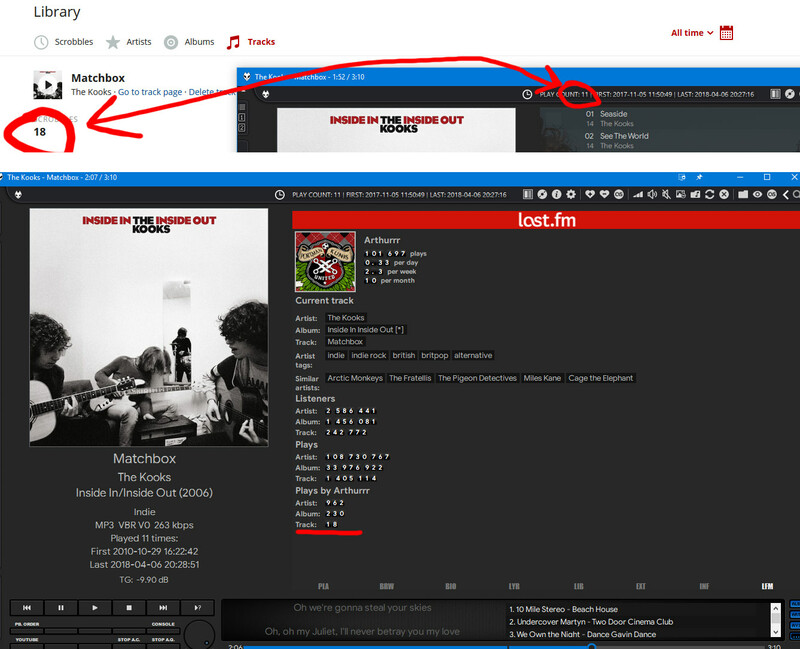 Hm... %lastfm_play_count% always returns 0 for me. Is there any way to enable logs to diagnose the problem? PS: Internet is accessed via proxy, so if foo_enhanced_playcount does not use fb2k network settings, this might be the cause. last.fm information is not retrieved automatically. You'll need to first play a song for 1 minute or right click on a track/tracks and retrieve scrobbles. Also make sure you set your username correctly in the settings. You might also need to uncheck the "compare album" option. If you've done all of those things and are still seeing only zeroes, manually attempt to pull scrobbles and paste what's in the console. I use foobar's HTTP method so it should respect the fb2k settings. Album/Title comparisons for last.fm now ignore all punctuation except for '(', ')', and '&'. This means "Can't Stop?" will match "cant stop" now (comparisons already ignored case). We request scrobbles by Artist, so those matches are determined by last.fm, not the component. All last.fm requests happen out of the main thread, and no longer block the UI. This means you will occasionally briefly see a popup when you begin playing a new track and scrobbles are requested. I wish I could suppress it but it doesn't seem possible. Streamlined a lot of code and removed some several unnecessary db writes, and metadb changed notifications. Please try it out and let me know if there are any issues. If not it'll be officially released end of this week. Whoops, I changed the Album/Title strings to strip out punctuation, and then still was doing comparisons with the old strings. Beta 2 fixes it, and removes an unnecessary code path when last.fm retrieval is disabled. Unfortunately it's more frequent than occasionally for me and sometimes it stays for up to 20 seconds. I use displayfusion though and made it so this popup immediately minimizes to tray so it won't bother me. Love that it requests the data when a track starts now. Yeah, if you're pulling 10k scrobbles, it could take awhile I'd recommend you finding your most frequently scrobbled artists and doing a manual pull on them. Should only take 20 seconds or so for the very first song and then the others should happen more or less instantly as the results are cached. Then when it pulls scrobbles on play it'll only be making one or two requests from last.fm. last.fm information is not retrieved automatically. You'll need to first play a song for 1 minute or right click on a track/tracks and retrieve scrobbles. Yup, that was it, thanks! Obviously I was talking about a single track fetch It's not necessary your component's issue, last.fm or my internet connection could be slow. Top text is info from your component, it's 11 instead of 18. 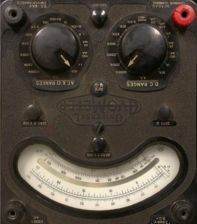 Somehow my ancient last.fm WSH panel shows the correct amount.